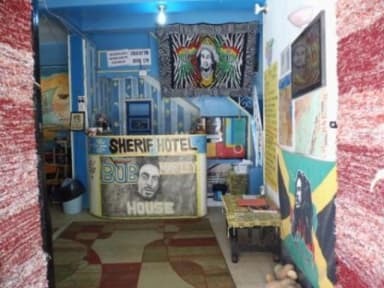 Bob Marley House Hostel i Luxor, Egypten : Boka nu! The staff is really sweet and super helpful! The hostel it self is pretty old and need to be looked over. There is a rooftop that's really good for hangin out and chat with other travellers in the evening. The owner arrange diving trips. They are really bad and potentially dangerous for beginners. They don't separate beginner groups and advanced divers. A French open water diver almost drowned when I went. If you're main reason with this trip is diving go with dinos instead. It's close to the main road.